Since the aim of the blog is to talk about all aspects of the food and drink industry, it’s only apt that I start including, occasionally, film and book reviews/mentions that predominantly revolve around food. To start off, I have chosen Jiro Dreams of Sushi which is a wonderful – you’ll be craving sushi by the end of it – documentary that is about a lot more than just food. 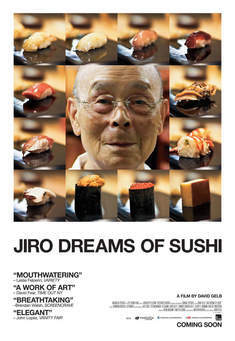 Jiro Dreams of Sushi has to be the most hunger inducing well-rounded documentary I’ve ever seen. Not only is it mouth-wateringly beautiful to watch, but special credit goes to the director, David Gelb, who approaches the subject in totality, by not only focusing the documentary on Jiro Ono, but also on everything and everyone that has had an influence on him and on those that he in return influences. Jiro Ono is considered as the top sushi chef in the world having a small unassuming three star Michelin Star restaurant in Ginza Tokyo Subway Station, Japan. Having given his whole life to the art of making the perfect sushi, the documentary is an insight into this art form and a walk down memory lane where we learn how Jiro reached his present day legendary culinary status. Where the documentary truly excels is that it moves its focus away from Jiro, in small welcomed intervals, and features the people around him; from his two sons who are an equally important part of his life, to his apprentices, to his friends, rounding off with the people who provide him with the raw materials of his trade. The audience as a result gets to see the complete picture as Jiro’s personal and professional life is dissected along with intricacies of making the perfect sushi and the changing nature of the business as eating sushi becomes more and more popular and commercial each year. Jiro Dreams of Sushi derives its name from the fact that Jiro, when he was young and working in a restaurant, would have dreams of sushi, wanting to make it different from the conventional norms. His life is inspirational when one realizes the dedication he has placed in this art and while some might consider it an obsession, and his methods to be eccentric, it is more of the obsession that has been the driving force for Jiro, who continues to work equally hard even at the age of 85. It is the philosophy, the technique, the heart that makes Jiro’s sushi special and he has no reservations about passing on his learning to his son, Yoshikazu, and his apprentices, whom he teaches for free if they work in his restaurant. As a result we see that he is not at all possessive about the art, which doesn’t mean he is lenient about it either, and it can take up to 10 years for an apprentice to truly understand and get a grasp of the techniques that makes Jiro’s sushi the best in the business. Moreover, Jiro is also fanatical about wanting to keep sushi pure by not mixing it up with other foods, and as a result his restaurant only serves sushi without the interference of other dishes and drinks that might take away from the pleasure of having the perfect tastes and flavours of the sushi. Jiro Dreams of Sushi is an informative, entertaining, and heart-warming documentary that looks at the life of an individual who has given everything to a culinary art, and still feels an incompleteness wanting to discover and do much more. It is a documentary that through the people digs deep into the culture of a country and how that too has an effect on the way personal and professional lives are carried on. It’s interesting to watch the different relationships Jiro shares with the people around him, especially his family members. The documentary is as much about the love for food as it is about the local culture and relationships. My only recommendation for when you watch the documentary, which you must, is that do not do so on an empty stomach, or at least have a plan ready in case you have to go out and eat afterwards because you will be left feeling hungry after watching the film.